...a crazy driver runs into a telephone pole down the street and breaks it in two places so there is no power on two blocks of your street on Friday night? First you go into town to get some good food. Then you come home and break out the candles and flashlights. 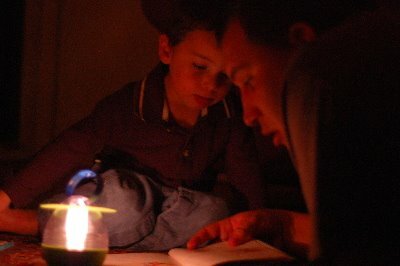 Jonathan was a little scared when we first got home because there was NO light at all. He was trying to turn on all the light switches and then he got upset. Thankfully, I had remembered to buy some more matches the day before or we would have been in big trouble. 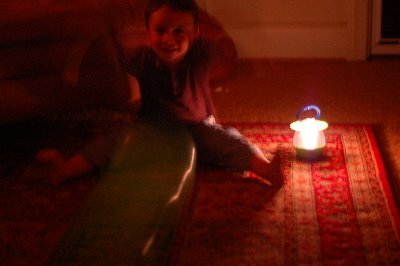 In the end, Jonathan liked rolling the ball back and forth and reading books with the flashlight. We didn't know the light switch was left on in his room, so in the middle of the night when the power did come back, the light in his room came on. He was a little startled, but he went right back to sleep. Last night when we got home, he started saying the lights were broken again. I guess he wanted to do it all over again. Thankfully we did have lights, since we were worn out from playing Bingo with people at the rest home. Jonathan was upset he couldn't win a teddy bear, but all the residents were happy to get prizes. And Jonathan was great entertainment. He was playing with a velcro ball and target game, and he only got into one argument with a lady over her beanie baby. They were both yelling at teach other in their grumpiest voices and hitting the table. To be fair, she did start it. I think he's looking forward to next time, and we now know to get lots more stuffed animals for prizes!